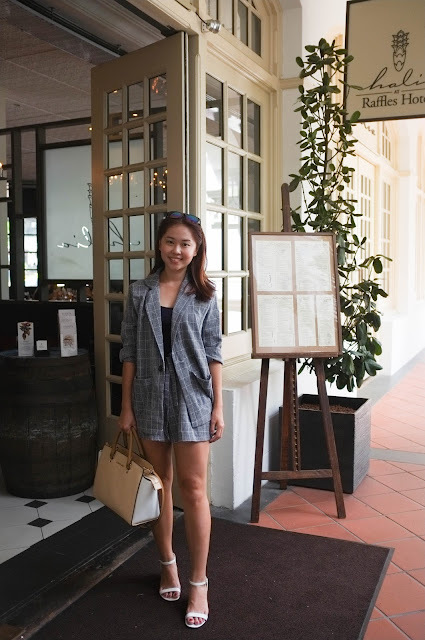 When I told my boyfriend that The Halia @ Raffles Hotel now has one for one dining promotion thanks to the Entertainer app, he got really happy because he once tried The Halia at their botanical gardens outlet and it was really good. 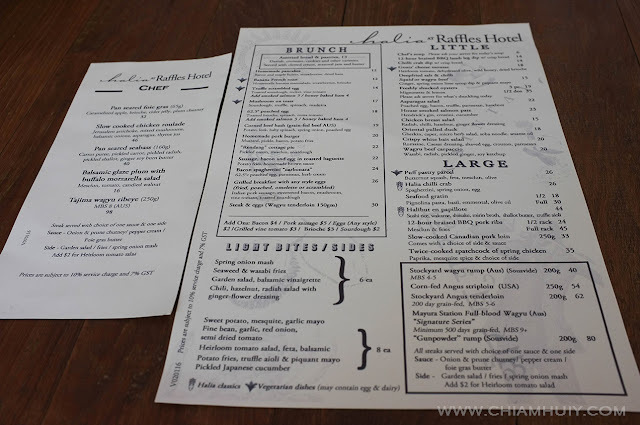 We both enjoyed our 1-1 meal here at The Halia because all their choices, from the starters to main courses, are all finger-licking good! What makes it even better is that their main courses are will be one-for-one if you have the Entertainer app, like me! We let the waitress recommend us the starters and main courses, and she really knows what to recommend. 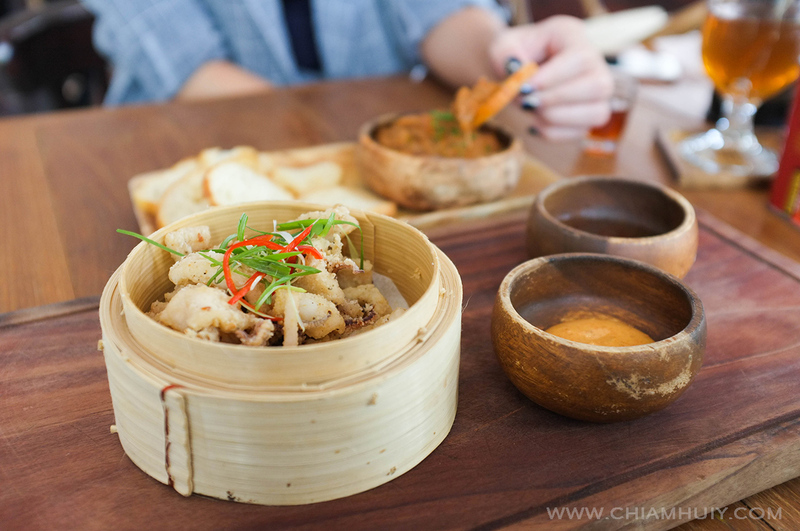 I was quite amused to see the Deepfried salt and chilli squid ($15) to be placed in those dim sum steamer plate. At first I was a tad worried that the fried squid will be dry and hard, but this appetiser simply blow me away. The spring onion lime syrup & piquant mayo made the squid even more delectable, I didn't leave a single bit remaining. 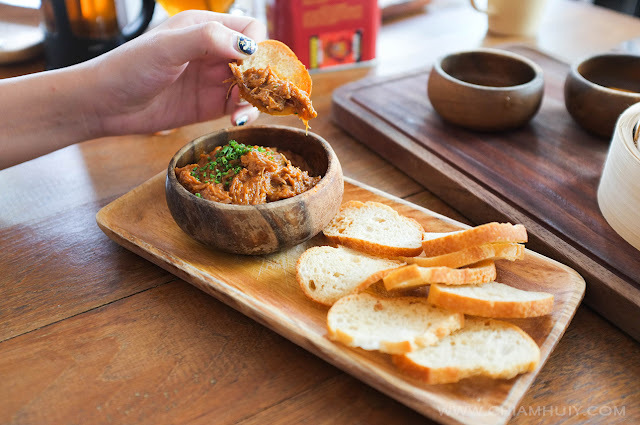 Another great choice to start your meal is the 12-hour braised BBQ lamb leg dip ($14). If you're like me who doesn't really fancy the smell of lamb, fret not. The smell of lamb isn't that strong in the dip and it just taste really yummy. Because it's been braised for 12-hour, the meat became both chewy and juicy, a great dip to pair with some crisp bread on the side. 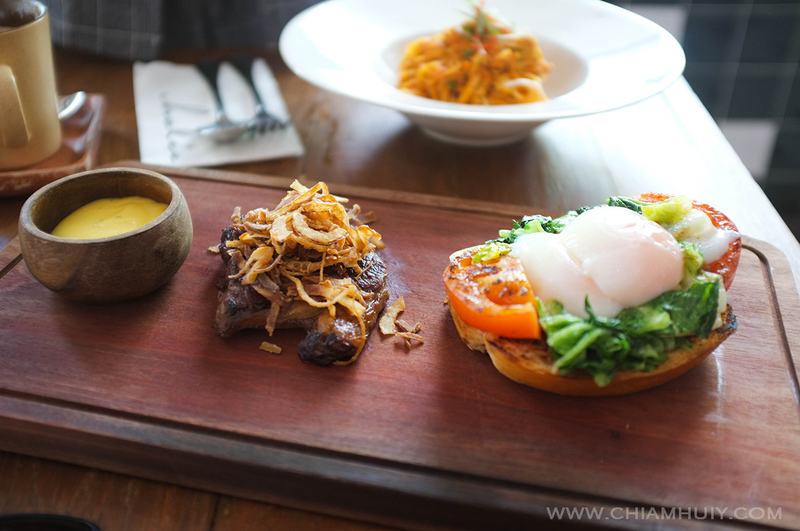 If you're a beef lover, try out the Steak and Eggs ($30) using wagyu tenderloin 150gm. Cut open the half-boiled egg to let the juicy egg yolk ooze out all over the toast - gosh, my bf really really loves this, I'm not that a fan of yolks though hahah. The steak of course is amazing, with fried onions drizzle on top to give the tender meat an added crunchy texture. They say if you're here at The Halia, you must not miss the Halia Chilli Crab ($26). I reckon this dish isn't that common elsewhere. 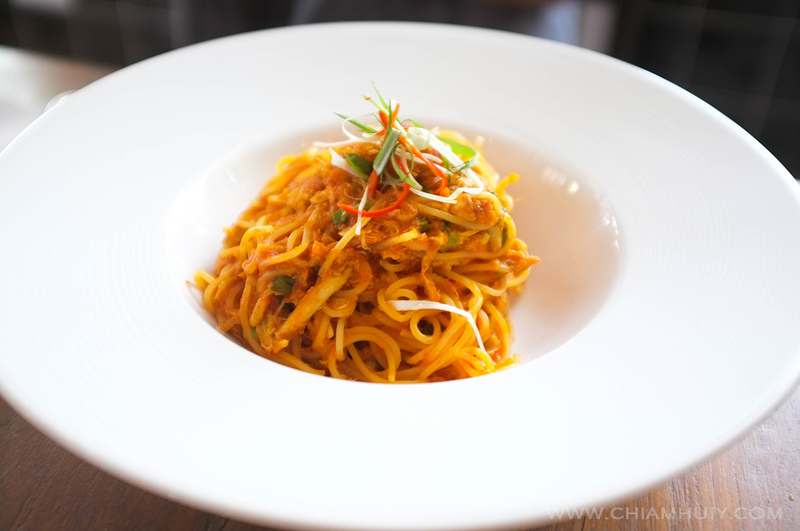 Usually pasta also comes in more watery sauces, but this chili crab pasta was a dry rendition. Nonetheless, the aroma and taste of chili crab fused with western pasta is definitely an amazing and delicious creation. Thumbs up for this! Of course, how can the gluttony me skip my dessert? This is named the Milk Chocolate Cloud ($10), and I can understand why when I see a pyramid of chocolate whip cream in front of me hahaha. 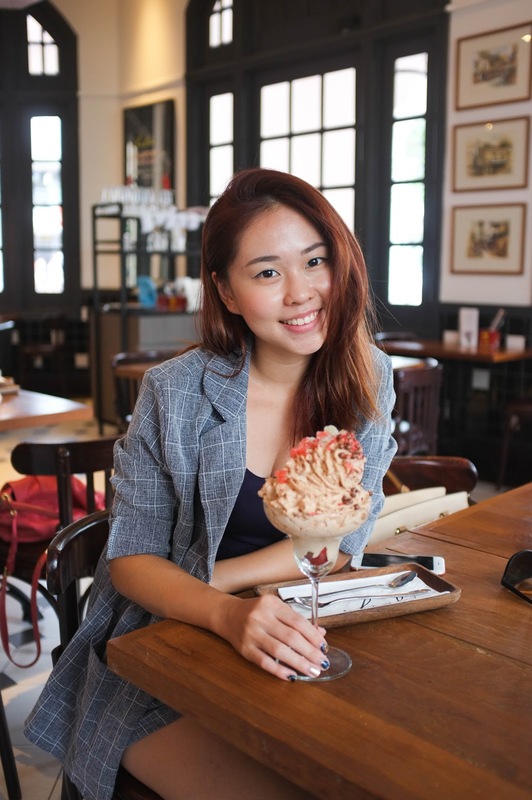 Not the best dessert I admit, but definitely an adored choice by all the sweet tooth out there! Fancy one-for-one dining promotions? You can enjoy it as well! Simply purchase the Entertainer app which can lasts you the entire 2016. 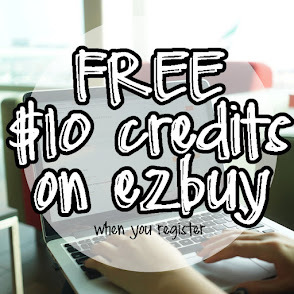 Quote '2016CHIAM' for $10 off! For more details, read more about the Entertainer app here! You're glowing in this picture bb!